Der aktuelle Kickstarter von Red Box Games endet. 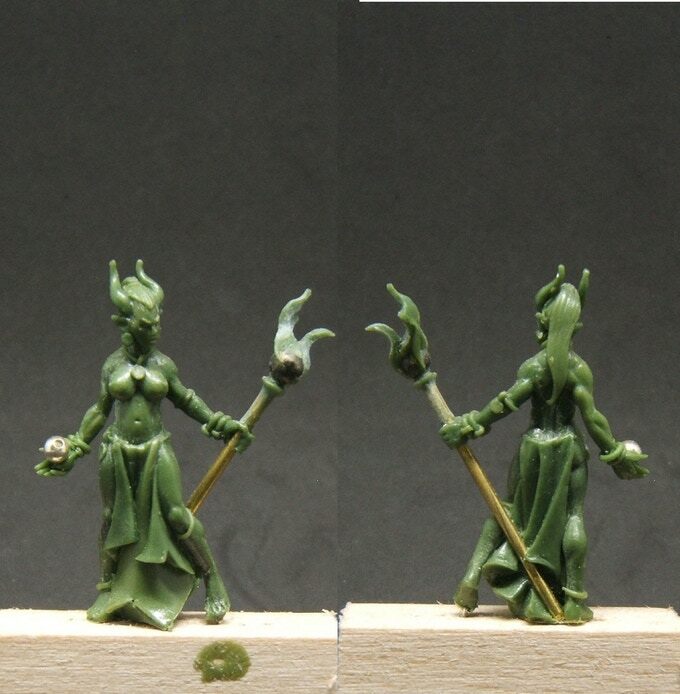 currently WIP the femme Daemonites are a set of 5 unique figures intended to fill the basic roles needed to support intrepid Warlocks and their champions in their dangerous adventures. Included in the set are 5 single piece figures 1 archer, 1 fighter with weapon and shield, 1 brute with battle axe, 1 weapons master with dual weapons, and 1 novice fighter with hand weapon. They will all have hair and be somewhat more clothed in their final state and will all have various weapons such as sword and shield, sword and axe, mace, battle axe etc. When funding reaches $12000.00 the Femme Daemonites will be unlocked as a $25 add on only. 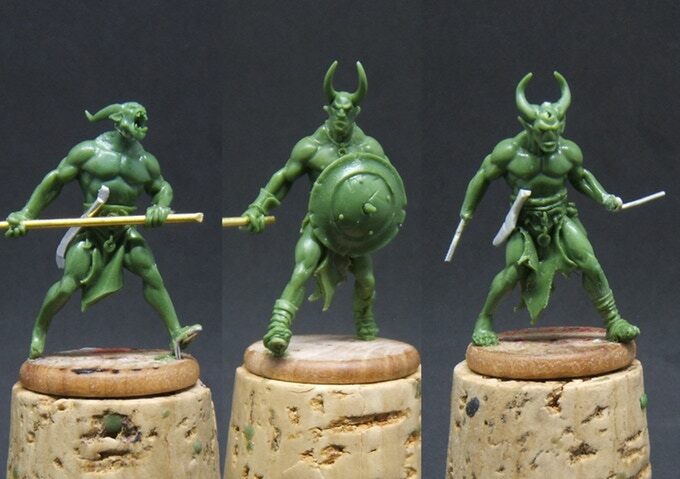 With your generous support we seek to fund the development of a new series of exquisitely sculpted, and expertly produced Dark Fantasy 28 mm metal miniatures of Daemonic Warriors and Sorcerors, sinister beauties, piteous undead, miscreant devils, and deranged cultists. Backers are free to add as many sets of the minions as they would like to receive. To do this simply manage your pledge upward by the amount of money needed to cover the additional sets Listed below you will find the individual sets listed alogn with their title and price. pictured here as slightly WIP. The spears held by the middle Minion will get some dressing up as will the club of the first minion and the pole arm of the last minion. Daemonite is a dual wielder and will have hands sculpted on fitted for universally interchangeable weapon options which it will share with the weapon and shield wielder. These weapons will include a cleaver sword, a mace, and an axe. 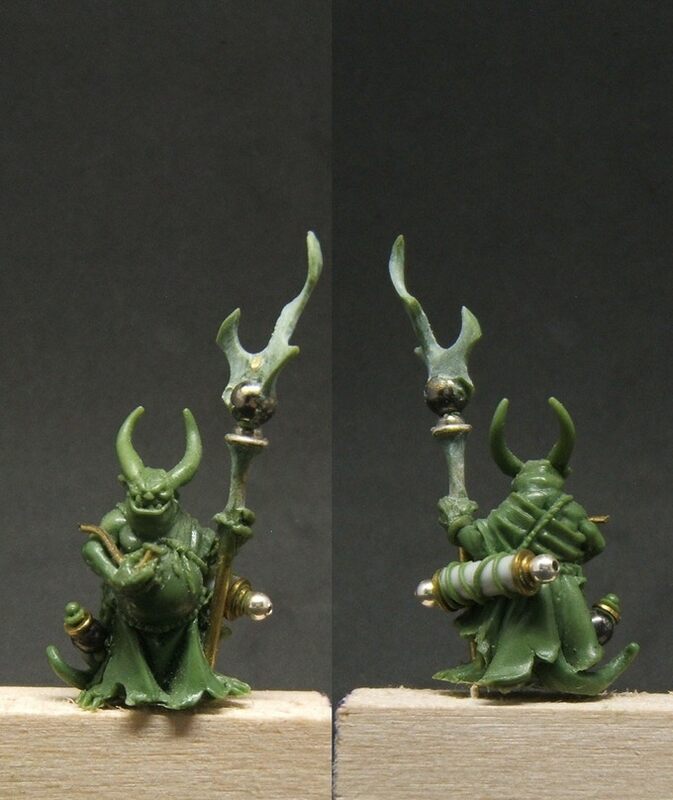 The first Daemonite will have the haft of his weapon dressed up a bit and will have three different weapon head options as well A blade, an axe bit, and a mace. The Daemonites also have universally interchangeable heads and will ship with one sprue of 3 different options, but I am planning to add more options to the funding as the funding allows. 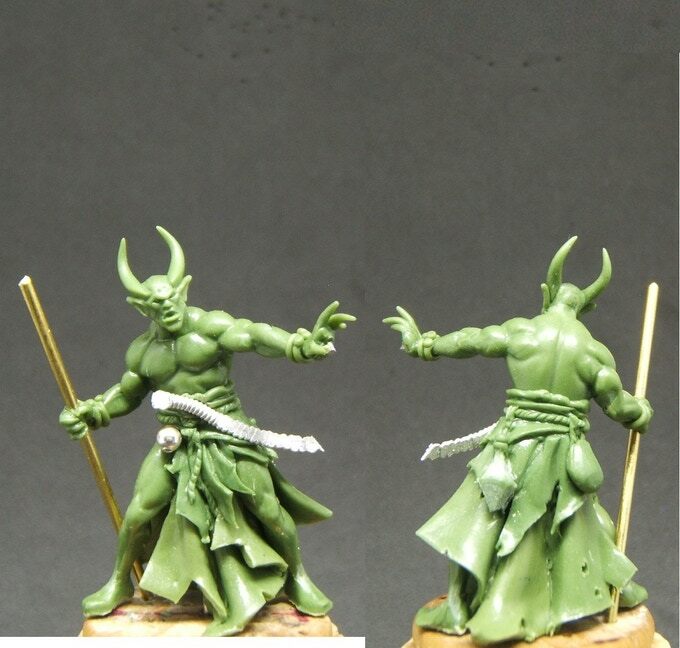 pictured here as a WIP set there are 5 unique figures in the set. 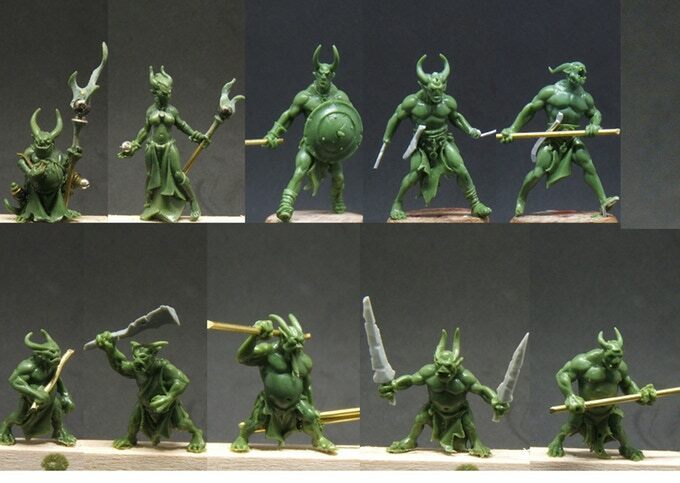 These figures are sold as an add-on to your existing warband or solo pledge only. 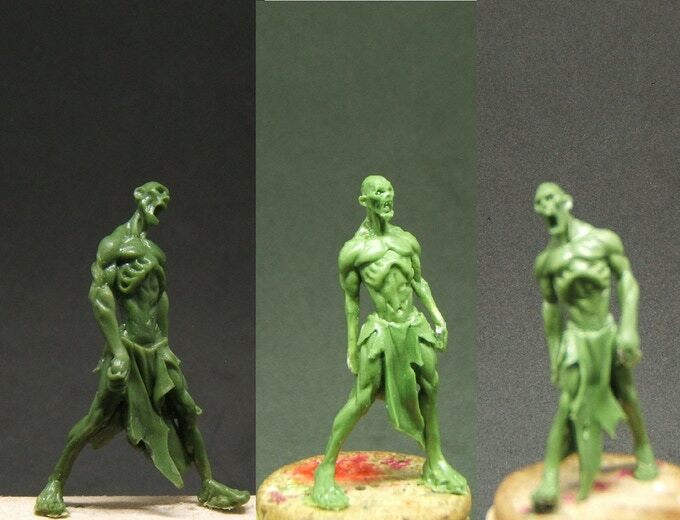 I will be adding pictures of the newly finished remaining 2 wretched undead as soon as the sculpts are completed. Die Kampagne endet in etwas mehr als 2 Tagen. Gott wie ist das schön mal wieder handgemachte Greens zu sehen bei sowas! Wären perfekt für ein Diablo-eskes Spielchen. Mmmh…. Dachte erst, mir zu teuflisch – aber tatsächlich super für Diablo. Sehr „nette“ Dämonen. Da ist viel brauchbares dabei.